Whether specifying a decorative border around a kitchen island, parquet floor in the foyer or a custom-designed medallion in the dining-room, wood floor inlays are a personal and enduring design element inside and out. Here, a manufacturer imparts technical information and the particulars of custom wood flooring specification. Hermitage Palace wood floor inlay from the mid-1700s. The custom wood floors that most of us are familiar with exist in Europe, where they decorate the French Chateau's, Russian Royal Palaces and Italian villas in Tuscany. Art Deco, Art Nouveau and the various Revival styles have all adopted marquetry and parquetry, in both public architecture and private homes. 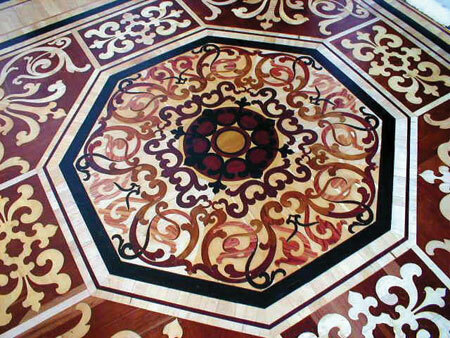 Ornamental floors with distinctive designs are now more popular then ever. Custom wood floors are made by precisely cutting the pieces of various domestic and exotic woods, then assembling them into intricate designs. 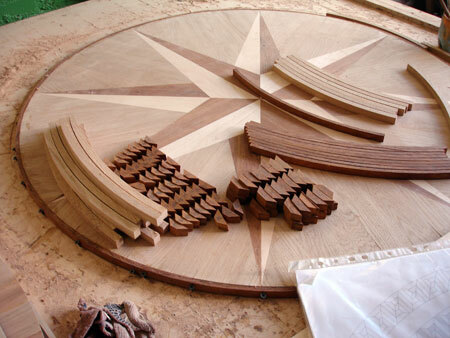 The wood can be cut using powerful laser machines or CNC routers. The laser has a tendency to leave a black "burn" line at the seems. For this reason Czar Floors uses computerized Routers to cut individual details. This allows for the tight fit in the final product. Inlays are pre-assembled, ready for glue-down installation. The woods in the inlays are not stained - the colors are all natural, wood tones. Compared to the “floor surface painted” designs - the inlays are not destroyed if the floors are refinished. There are several design elements that can be used in the decorative hardwood flooring. APRON - Wood flooring outside the border. Also called frame or skirting. Often this area is filled with the regular wood plank flooring. Plank can be laid parallel to the walls or 90 degree to the walls. Typically, the borders would be installed about 12" off the wall, leaving the space for the apron. This is done so that the border is not hidden from view, and so that adjustments can be made to provide equal width aprons for ends and sides. area, outside the field. Borders can be used to define a specific area or create a decorative threshold between the rooms. Ornamental borders can follow a room’s perimeter or the hearth of a fireplace. They can mirror the shape of a chandelier in a foyer, surround a dining room table. Borders are typically produced in about three feet solid sections with repeating pattern. Check the Czar Floors' Borders Selection.. CORNER BLOCK or BORDER CORNER- A border element designed to complement the border pattern, interrupting the flow of the pattern at the corners usually at turns. Typical corner block is a square piece installed where the border must turn 90 deg. Czar Floors can produce custom border corners with other angles. Some models do not require the corner blocks if the boards can be mitered 45 deg. in the intersection. FIELD - The main area of the floor inside the border. Field can made with the regular plank floor, Herringbone pattern or parquet. (Check the Herringbone options). Plank and herringbone can be installed diagonally to add a visual dimension to the field. Parquet floors are the wood pieces pre-assembled as tiles, ready for the glue-down installation. From the classic Fontainebleau pattern, to the futuristic 3-D cubes design, the variations of the parquet can be infinite by changing the wood species, sizes and type of installation. MEDALLION/INLAY - A pattern located at a focal point of the floor. A medallion is an inlay in round, oval, square, etc shape that can be installed as a focal-point in the middle of the room. Medallions are available in various sizes like 30”, 40”, 48”, etc. 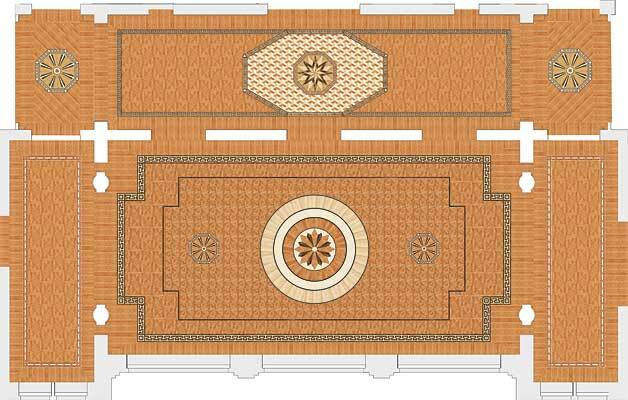 (Czar Floors designed and installed a 45 ft. diameter medallion, the largest in the world). They can be retrofitted in the existing floor or installed as a part of new flooring. 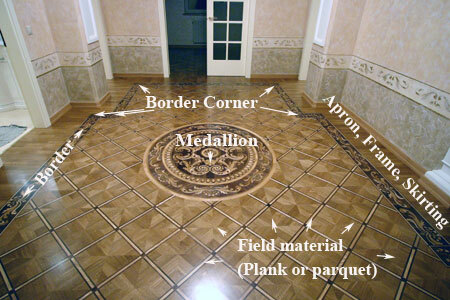 Czar Floors can match the thickness and finish of a medallion to the surrounding floor. To pick the size of the medallion - take the smaller size of the room. If you are using the border choose the medallion about 1/3 of that size. If there is no border - use between 1/3 and 1/2 of this distance. Narrow, elongated room may look better with the oval medallion. Check the Czar Floors' Medallions Selection.. The manufacturers may offer ready-made or made-to-order wood floor designs. Generally speaking, “What you see is what you’ll get.” Floor designers can coordinate colors, patterns and sizes with other surface elements. This is a more expedient approach. However, an entirely unique and personal result awaits the client or design professional who is ready for deeper involvement. By engaging a flooring artists’s talent, a design can be developed that incorporates the client ideas. This is a lengthier process that produces a greater reward. Visiting Czar Floors’ Gallery will help to prepare for the plunge into the specification process, in which design, materials, costs and schedules must be sorted out. Architects and designers may be interested to check the architectural drawings that were prepared by Czar Floors for the previous projects. Our designers can help in planning the entire house flooring. Color rendering of the floor plan will help to visualize the design. If planning a custom design, it’s easy to carry out this process by exchanging images and ideas via e-mail. Once the general parameters and budget have been established, the wood floor designers will create preliminary sketches for discussion, possible revision and final working drawings. Read more about custom design.. Schedule (rushing incurs increased expenses). The floor manufacturer will often compute direct costs and estimated labor time for one figure, then compare it to a price-per-square foot calculation that has been done on comparable projects. To make the selection process easier, determine the overall style of the interior — rustic, contemporary or traditional, for example. At this point, eliminate certain flooring design elements that typically do not lend themselves to that particular interior style. It is common to use the natural colors of the various media rather than relying on stain to impart color. Check the wood selection. If the existing color of the wood is used, the whole floor can be sanded at once and then finished with a clear finish. It is more complicated to stain the field with a dark stain and the border with a natural stain, and it also may create a dilemma the next time the floor is sanded. pattern with a design that is equally or more complicated. The border defines the field, so it should contrast to some extent. A complicated border calls for a less intricate field, and vice versa. The field dimensions should work out so that the outside edges of the field and apron finish with half or whole repetitions of the pattern. Finishing with partial pieces would not be pleasing to the eye. CUTTING ALLOWANCE - When estimating the amount of flooring to be ordered, the extra amount needed to allow installers to make cuts. Typical waste is around 7-10%. For the diagonal parquet installation or with odd shaped rooms add 15%. You may use our floor calculator to estimate the materials. degrees with the surface of the piece. This exposes the springwood and summerwood of the annual growth ring to produce a pronounced grain pattern. QUARTERSAWN - Lumber in which the annual growth rings of wood form an angle of 45 to 90 degrees with the surface of the piece. In quartersawn boards, the medullary rays in ringporous woods are exposed as flecks that produce a distinctive grain pattern. Typically more expensive then plainsawn. Recommended for the radiant heated floors due to better dimensional stability. FILLETS - The small pieces used to form fingerblock parquet patterns. Also called fingers or slats. Life is short, and wood floors last a long time. Why not create something as enduring and delightful as the wood materials themselves?